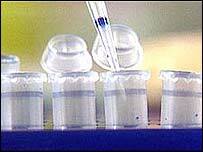 The results of genetic tests should be available to insurance companies, a leading medical ethics expert has said. Professor Soren Holm, of Cardiff Law School, says results of gene tests for serious illnesses are no different to other medical data already disclosed. He argues in the British Medical Journal there are not any "principled reasons" for objecting to disclosure. Opponents fear unfair discrimination, arguing a positive test for a "disease" gene does not mean illness is certain. There are now dozens of genetic "markers" for common serious diseases such as cancer and heart disease. The Wellcome Trust announced on Wednesday that its own research had pinpointed genetic variants linked to depression, Crohn's disease, high blood pressure, rheumatoid arthritis and diabetes. However, having the relevant gene or genes may only slightly increase a person's overall risk of developing that disease at some point in their lifetime, and a positive test does not mean that the illness is certain. Life insurers already use complex calculations based on age, existing illnesses, lifestyle and weight to calculate the expected lifespan, and the risk of disease in someone applying for a policy. Professor Holm said that the information used to make these calculations was no less private than genetic test results. He said: "If we allow insurers to obtain some kinds of health information, such as body mass index, cholesterol concentration, or results of a physical examination, we no longer have any principled reasons for excluding genetic information. "It is not inherently more specific, predictive, sensitive or private than other kinds of health information. "It is true that many so-called genetic risk factors are not well validated, but the same is true of other risk factors measured by non-genetic means." However, Professor Richard Ashcroft, a biomedical ethicist from Queen Mary, University of London, said that insurers might use the information for "irrational discrimination". He said: "It is important to note how genetic information can be misunderstood, or its importance overestimated, and therefore used in discriminatory ways that would not be justified on sound actuarial grounds." He gave the example of the BRCA1 gene in breast cancer, which actually makes little difference to the life expectancy of the woman. "A naive insurance salesperson might think she represented a poor risk for life insurance," he said. There is currently a moratorium until 2011 on the right of companies to ask for disclosure of all but one genetic test. People who test positive for the gene which causes Huntington's Disease are 100% certain to develop this disabling and ultimately fatal disease, and insurers have been granted the right to ask for results to be revealed to them. A spokesman for the Association of British Insurers said that it supported the moratorium, though it would be keeping "a close eye" on developments in genetic testing in years to come.